Things have a way of reoccuring in my life - like "themes". Aaron got me this balloon for my birthday - he thought the bouncy eyes were funny. (I like the clam with the party hat!) So we started saying this around the house "Who drank the last of the milk?!" 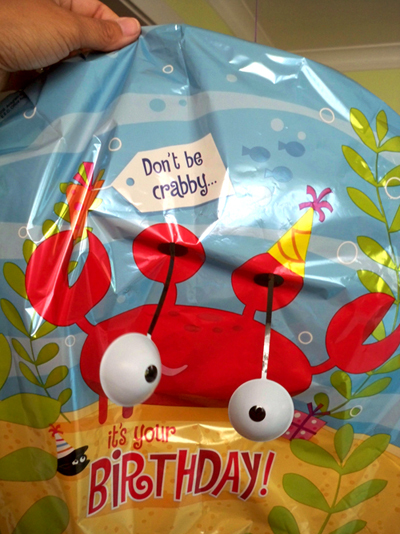 "Don' be crabby! It's your birthday!" Then I was in a gift shop at the Outer Banks and I saw this keychain. 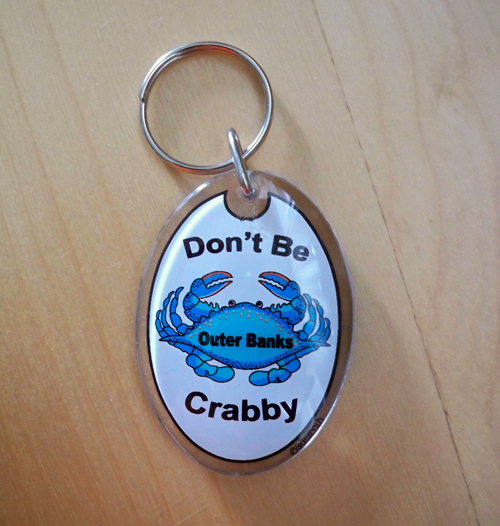 So now this keychain gets carried around the house and if even the cat gets a little testy - Don't be crabby! PS--Love the new ljc header! u have some great pictures in ur blog! i use kodak easyshare v1003. but the lcd is broken right now, i need to fix it..
That is seriously the cutest baloon in the world : ). Love it.